Like many kids, first-grader Cohen Morano likes to watercolor. What's different about his paintings is that his father, Aye Jay, sends them out into the world to be added to and altered by a stellar roster of lowbrow artists, children's illustrators, and street and graffiti artists. The resulting collaborations between Cohen and everyone from Gary Baseman to Shepard Fairey to Paul Frank form a stunning and playful body of work, with a focus on the creativity of childhood. Cohen Morano is an eight year old elementary school student from Chico, Ca. From the age of two he's painted and collaborated with artists from all over the world. In addition, he has designed a skateboard for Foundation and has had several solo art shows. His likes include Star Wars, Gardenburgers, playing at the park, cartoons, mac and cheese, and Legos. His dislikes include Mayonnaise and Meat. When he grows up Cohen would like to be a 'Moviemaker.' This is his first book. Aye Jay Morano is the author of The Gangsta Rap Coloring Book, The Heavy Metal Fun Time Activity Book, and The Indie Rock Connect-the-Dots book. He lives with his wife and two children in Chico, California. Unfortunately, rather than the artists starting with subject matters then being able to embellish, improve, or modify them, the child is so young that all you get is finger paint splotches that do not lend themselves to much. It might be helpful to see a small inset of the child's work before as well. This was a great idea, however you need a slightly older kid....one who paints subjects, themes, ideas rather than these smears. I think he was only 2 when he did these. Also, the artists spent little effort on their input. This could have been oh so much better. I am disappointed in this book. 5.0 颗星，最多 5 颗星Unbelievable collection of artists collaborating with an 8 year old with great success. You wouldn't think this number of people could create relevant and varied enough art based on an eight year olds water colors. But then you would be wrong. 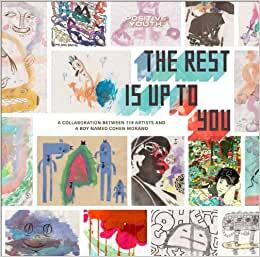 A not-to-miss art book for those who collect art. and or books.